The occupation authorities escalated their violations and assaults against Jerusalemites, their properties and holy sites during the month of September. Wadi Hilweh Information Center said in its monthly report that the occupation authorities targeted human, trees and property in which the most prominent of these violations was against Al-Aqsa Mosque. Educational and medical institutions and their staff were also assaulted by the occupation authorities’ assaults as well as media crews, sports clubs and Islamic cemeteries. The center said in its monthly report: “The occupation forces raided Al-Aqsa Mosque five times while fully armed and closed it in front of Muslim worshippers ten times. They also assaulted all the people present inside Al-Aqsa and at its gates including women and Al-Aqsa guards and also damaged the historical windows and burned carpets and wooden doors. The number of detainees in September was the highest since the beginning of the year after a new unit was formed to chase stone and Molotov Cocktails throwers in Jerusalem concurrently with the Jewish holidays. Al-Aqsa Mosque was the highlight of events during September as the occupation authorities and Israeli settlers escalated their assaults and violations at Al-Aqsa during the Jewish holidays which was taken as a chance to break-into the courtyards of Al-Aqsa, close its gates and prevent Muslims from entering in addition to turning it into a battle field; note that the Jewish New Year and Sukkot holidays fell into the month of September. During September 2015, the armed Israeli forces (Special Forces, snipers, Intelligence and police) raided the courtyards of Al-Aqsa Mosque five time on the 13th, 14th, 15th, 27th and 28th of September and attacked worshippers who were mostly old people with sound grenades, rubber bullets and pepper gas; they also harassed and beat them with batons. The forces surrounded Al-Qibali Mosque and closed its gates with iron chains and wooden blocks and also ascended on its roof. The occupation authorities deliberately damaged historical parts during the raid and also damaged the protection bars on the windows using special tools. They also deliberately fired sound grenades inside Al-Qibali Mosque causing several square meters of the carpet to burn. During the raids, the occupation authorities closed Al-Aqsa Mosque in front of Muslims. On the 13th of September, the forces prevented young men from entering Al-Aqsa to perform the Dawn Prayer, and prevented all Muslims from entering after 6:30 a.m. until 11 a.m. On this day, the forces also assaulted the employees of Al-Awqaf Islamic Department and beat the director of Al-Aqsa Mosque and fired a sound grenade towards him. They also assaulted and beat Al-Aqsa guards and evacuated them by force from the courtyards through Al-Silsileh, Dung and Al-Majles gates. During raids, the forces deliberately fired sound grenades towards Al-Qibali Mosque which led to the burning of several square meters of carpet. The occupation authorities closed Al-Aqsa Mosque in front of Muslim during the raids. On the 13th of the month, the forces prevented young men from entering Al-Aqsa to perform the Dawn Prayer, and prevented all Muslims from entering after 6:30 a.m. and until 11 a.m. On this day, the forces assaulted the employees of the Islamic Awqaf department and assaulted Al-Awqaf director as well with a sound grenade; they also beat Al-Aqsa guards and evacuated them from the courtyards by force through Al-Silsileh, Dung and Al-Majles gates. On the 14th of September and for the first time, the occupation authorities executed arrests from inside Al-Qibali Mosque after breaking into it and prevented those under the age of 45 from entering Al-Aqsa Mosque. The forces also raided Al-Qibali Mosque on the 15th and arrested one young man. On the 27th of the month, fourth day Al-Adha holiday, the forces raided Al-Aqsa and limited clashes broke out in the courtyards after worshippers were trapped inside Al-Qibali Mosque, while on the 28th of the month, the forces brought iron shields inside Al-Aqsa through Dung Gate for the first time to protect themselves from stones, and also for the first time the forces did not withdraw from the courtyards after clashes were over but were stationed for nearly half an hour near the eastern side of Al-Aqsa snipers were stationed on the roofs. The series of assaults against Al-Aqsa Mosque continued and occupation authorities prevented Muslims from entering and praying at Al-Aqsa which forced them to pray at Al-Aqsa gates. On the 13th of September, they performed the Dawn Prayer at the gates, the Night Prayer on the 21st, all five Prayers on the 22nd, Dawn Prayer on the 23rd after men under the age of 40 were prevented from entering Al-Aqsa, Evening and Night Prayers on the 27th after men under the age of 50 were prevented from entering, and on the 28th, 29th and 30th all five Prayers were held at Al-Aqsa gates including women as females under the age of 50 were prevented from entering Al-Aqsa Mosque. The occupation authorities imposed restrictions on the Friday Dawn and Noon Prayers on the 18th of September as men under the age of 40 were prevented from entering Al-Aqsa. Accordingly, hundreds of young men performed the Noon Prayer in the streets of Jerusalem during which Israeli forces assaulted the worshippers in the streets with beating and pushing. During September, 1575 settlers including the Minister of Agriculture, Uri Ariel, broke into Al-Aqsa Mosque. The last day of the month witnessed the largest number of settlers breaking into Al-Aqsa (257) followed by the 29th of the month (178), and the Jewish New Year’s Eve (158); note that some settlers performed their religious rituals inside he courtyards of Al-Aqsa Mosque. The occupation police prepared a list of nearly 60 female names including journalists known as the “black list” following an order from the Chief of Israeli police in the Old City of Jerusalem, Avi Baytoon, against women who create problems inside Al-Aqsa Mosque. Every female attempting to enter Al-Aqsa Mosque has to present her ID to have her name checked before entering and if it is not in the list, she will be allowed to enter. It is noteworthy that the list was prepared at the end of last August and names were added to the list as ordered by Avi Baytoon. During the month of September, women included in the list were prevented from entering Al-Aqsa Mosque during the settlers’ break-in session (7 a.m. until 3 p.m.) and women were assaulted with sound grenades and beaten while staying at Al-Aqsa gates; several men were also arrested. In a dangerous escalation, the so-called Minister of Defense, Moshe Yaalon, issued a decision considering the Marabouts at Al-Aqsa Mosque as an “illegal organization” that aims at disturbing public security at Al-Aqsa through obstructing the settlers’ break-ins to Al-Aqsa and creating problems” as recommended by the intelligence service “Shabak” and the Israeli police. The occupation authorities isolated 47 Palestinians from Al-Aqsa Mosque last month, and also deported some of the 1948-lands Palestinians from the city of Jerusalem; 9 women were among those isolated and deported. Wadi Hilweh Information Center monitored nearly 300 arrests during September 2015 including 16 women and 104 minors between 13-17 years old. Also, among the detainees were 21 students aged between 8-17 years that were arrested while going to school or after leaving school; one journalist photographer was also arrested. Among the detainees were also 22 children aged between 8-12 years. Most of them were arrested, detained in the police vehicles or detention centers and interrogated alone without the presence of their parents. In a precedent against children, the Chief of Police in Jerusalem issued a decision to extend the arrest of two children from the village of Esawyeh. During last month, 61 citizens were arrested at Al-Aqsa Gates and from its courtyards. The arrests mostly occurred in Silwan (79) followed by the Old City of Jerusalem (56), Esawyeh (39), Al-Tur (30), Jabal Al-Mukabber (20), Sur Baher (18) and several arrests from Sheikh Jarrah, Beit Hanina, Um Tuba, Shu’fat refugee camp and Wadi Al-Joz. Young men were not given a break from arrests during Al-Adha holiday (24-27 September) as the Israeli forces carried out a series o arrests after raiding and searching houses in an attempt to steal the joy of the holiday and harass Jerusalemites. During the 4-day holiday, the forces arrested 44 Jerusalemites mostly from Silwan and Sur Baher. The number of detainees remarkably increased towards the end of the month in conjunction with the Jewish holidays (New Year and Sukkot) and the formation of a new unit by the occupation police that is focused on arresting stone-and- Molotov Cocktails throwers as ordered by the Chief of Police in Jerusalem. The unit was named “unit of tracking down stone-and Molotov Cocktails-throwers” and is specialized in arresting Jerusalemites and interrogating them regarding the participation in clashes and throwing Molotov Cocktails and stones. The new unit is based at Jabal Al-Mukabber police station “O’z Center”. Since the formation of the unit, 248 Palestinians from Jerusalem were arrested. Since the beginning of the new school-year, the occupation authorities continued violating the Jerusalemite students’ right to education. The three schools that suffered the most were located inside Al-Aqsa Mosque (kindergarten, Al-Aqsa Boys School and Al-Aqsa Girls School) and have more than 500 students enrolled in all of them. During the break-in days and clashes, the occupation forces imposed restrictions on the entrance of students and education was disrupted on the 13th and 15th of the month, and on the 28th was disrupted in the kindergarten and boys school. On the 15th, the director of Dar Al-Aytam School was forced to stop classes during the second class and sent the students home after the occupation forces ascended the roofs near the school and were randomly firing grenades and rubber bullets in the area; Dar Al-Aytam School is located near Al-Majles Gate. A sound grenade was fired towards Princess Basma School for special needs and the school’s guard and two teachers were assaulted. During September, 21 students were arrested while heading to school or after leaving school in the areas of Al-Tur, Old City of Jerusalem, Damascus Gate and Esawyeh. Several students were injured with bruises and some were wounded due to being targeted after they were prevented from reaching their schools. The occupation forces targeted the Jerusalemite villages, residents and various institutions during the month of September and ran over one young man in Silwan. In an assault against medical institutions in Jerusalem, a Palestinian Red Crescent ambulance was assaulted and under the threat of the weapon the staff was forced to head to Hadassah Ein Kerem hospital and the injured young man was arrested. The forces also raided the building of Al-Maqased hospital and searched the emergency and x-ray departments as well as offices and restrooms; they also checked the patients’ records looking for injured people. In an assault against media institutions, the occupation forces raided the office of “Pal Media” in Mount of Olives in Jerusalem and searched the offices and left a call for interrogation for the director. Also, press crews in Jerusalem were subject to beatings, arrest, harassment and various threats while covering the events in the city especially around Al-Aqsa Mosque. The forces also raided Silwan Club in the neighborhood of Ras Al-Amoud twice during September and checked the IDs of young men and took pictures of them. Dead Muslims were also assaulted during September as the settlers and Nature and Parks authority attempted to seize new areas of Al-Rahmeh cemetery and placed barbed wires on some parts of the cemetery; they also stepped on top of the graces and cut several trees to turn it into special paths for “national parks” around the walls of the Old City of Jerusalem. The village of Esawyeh was directly targeted when entrances were blocked used soil, cement blocks and iron barriers during the whole month. Municipality staff and occupations forces raided the village on an almost a daily basis, infantry units raided the streets of the village, checkpoints were established, young men were searched and rubber bullets and grenades were randomly fired in the village. During September, four children from the village of Esawyeh aged between 11-15 years were injured with “black” rubber bullets (injuries in the head, neck, thigh and back) and suffered wounds and bruises in addition to a state of severe fear. On the eve of Al-Adha holiday, the occupation authorities isolated the city of Jerusalem from its outskirts due to the Jewish holiday “Kippur” neglecting the need of Jerusalemites to shop and move on this day. Wadi Hilweh Information Center monitored the closure of the entrances of Sur Baher, Jabal Al-Mukabber, Esawyeh and Silwan in addition to closing the main streets leading to them and closing the freeways leading to north Jerusalem. 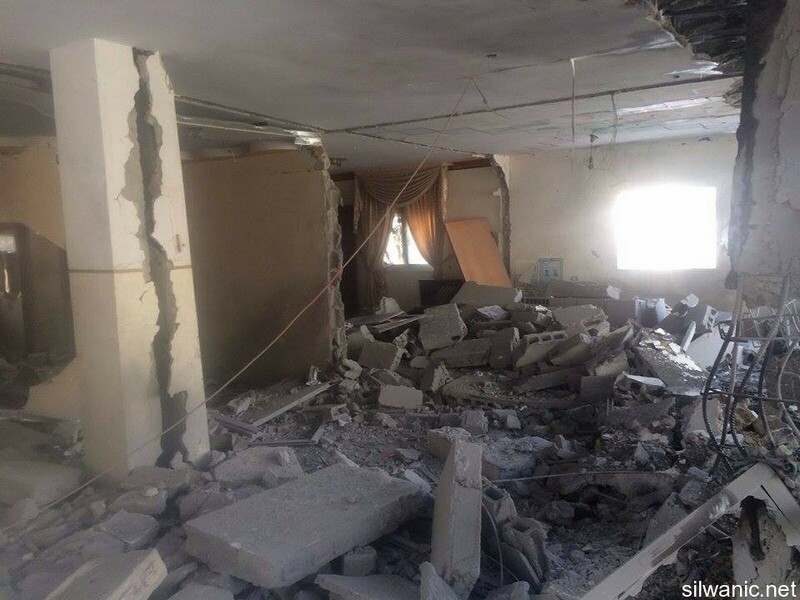 At the beginning of September, settlers took over the apartment of the late Jihad Sarhan in the “Middle Neighborhood” in Batn Al-Hawa using ropes in a deal done by “Jamal Sarhan”. Settlers living in the building of Jamal Sarhan which was sold to settlers towards the end of last August were able to enter the apartment of Jihad and also dropped some furniture inside it. While the locals confronted the settlers, police arrived and assaulted and beat them and provided the settlers with full protection to seize the house. Settlers attacked last month the young man Mustafa Jamil Hashlamon and beat him while he was heading to work in West Jerusalem. Also, dozens of settlers protected by Special Forces attacked a group of children in the neighborhood of Batn Al-Hawa in Silwan and sprayed them with pepper gas and fired sound grenades towards them. The occupation municipality demolished in September an under-construction house in Silwan owned by Abbasi family. They also demolished a farm in the village of Esawyeh that was established 10 years ago; the farm also had two rooms. In its Weekly Report On Israeli Human Rights Violations in the Occupied Palestinian Territories for the week of 01 - 07 Oct. 2015, the Palestinian Center for Human Rights (PCHR) found that Israeli forces killed 4 Palestinians including a child, and wounded 144 Palestinians, including 55 children, 2 photojournalists and 2 girls, were wounded in different shooting incidents. The report did not include the 7 Palestinians killed and 153 injured on Friday, after the weekly report had already been released. In the West Bank, on 03 October 2015, Israeli infantry opened fire at a Palestinian young man from the Bireh, who had stabbed 2 Israeli settlers near the Hospice Hotel in al-Wad Street, in the Old City in East Jerusalem. As a result, he was killed by several bullets to the neck and head. On 04 October 2015, Israeli forces wilfully killed a 19-year-old Palestinian civilian from al-Eisawiya village, northeast of occupied Jerusalem, after he was chased and beaten by settlers. Israeli forces claimed that the victim attempted to stab a 15-year-old settler, due to which that settler sustained moderate wounds, and then he escaped to Street no. 1 before the Israeli police arrived and shot him dead. Even if the Israeli claim was true, Israeli forces could have used less force or abducted the Palestinian, especially as he walked enough distance before he was killed without posing any threat to the Israeli officers or settlers. In another crime of the use of excessive force, on 04 October 2015, Israeli forces killed a Palestinian civilian and wounded 2 others. Israeli forces opened fire at dozens of Palestinian civilians protesting around "Gishori" factories, west of Tulkarm, against the settlers' raids on al-Aqsa Mosque. In another crime of the use of excessive force, Israeli forces stationed at the security gate at the annexation wall, east of Ayda refugee camp, shot dead a 14-year-old child and wounded another one when Israeli soldiers opened fire at a group of children near the UNRWA centre at the entrance of the above-mentioned refugee camp, as clashes erupted there between Israeli forces and Palestinian civilians. During the reporting period, 148 Palestinian civilians, including 55 children, 2 photojournalists and 2 girls, were wounded in the West Bank. Moreover, 240 Palestinian civilians, including a photojournalist, were wounded in East Jerusalem and a girl sustained a serious wound when a settler opened fire at her. On Wednesday, 07 October 2015, an Israeli settler opened fire at a Palestinian girl from Sour Baher village, south of East Jerusalem, while she walking in al-Wad Street in the Old City. As a result, she sustained 4 bullet wounds, due to which she was taken to Hadasa – Ein Karem Hospital in West Jerusalem. Israeli forces claimed the girl had stabbed a 35-year-old settler; therefore, the settler opened fire at her. Moreover, during the reporting period, Israeli forces deliberately targeted Palestinian ambulances and their crews while on duty. Between October 1st and 7th, Israeli forces conducted 56 incursions into Palestinian communities in the West Bank. 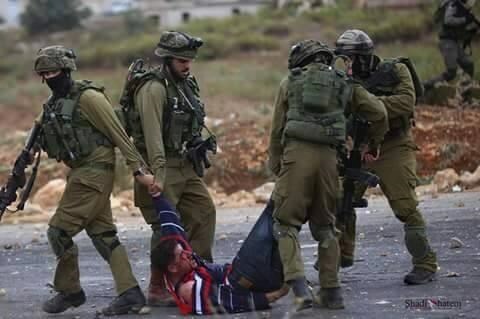 Israeli forces abducted 78 Palestinian civilians, including 12 children. 24 of them, including 5 children, were abducted in occupied East Jerusalem. An Israeli undercover unit raided the Arab Specialist Hospital in Nablus and abducted a Palestinian patient. According to a report by a PCHR fieldworker in Nablus, on October 5th at approximately 04:00, Israeli undercover units wearing plain clothes. They used two civilian cars with Palestinian registration plates. The two cars stopped in front of the Arab Specialist Hospital in Rafidia neighbourhood in the west of the city, and 5 persons dressed in plain clothes stepped out of them. One of those persons pretended to be wounded and headed to the main entrance of the hospital, which was closed. Members of the special units asked from the hospital staff to open it, but they refused telling them to head to the ER department in the western side of the hospital. After arguing, they took their guns out and pointed them at the hospital staff forcing them to open the door. They went up on the hospital stairs to the third floor and knocked on the main door of the floor, where a nurse identified as Mohammed 'Amriyah was on duty. He opened the door for them, but the undercover members did not wait for him to complete his talk and pushed him strongly with his face against the door. He then fell on the ground, and they entered the room next to the door, where Karam Lutfi Rezeq al-Masri (23) who is an engineer from Nablus, was. Karam entered the hospital at approximately 23:00 on Thursday, 01 October 2015, as a solid body fell on his left palm. The undercover members immediately asked him about his name as there was another person in the room. Two of them carried him and went to the first floor via the hospital stairs. They threw him there and then pulled him from his shoulder and hands taking him to an unknown destination. Many checkpoints were established in the West Bank. 10 Palestinian civilians, including 3 children, were abducted at checkpoints. Israeli forces continued efforts to create a Jewish demographic majority in occupied East Jerusalem. Two houses were destroyed in al-Mukaber Mountain area and a room was closed with concrete in al-Thawri neighbourhood on the ground of collective punishment. 13 neighbouring houses and minarets sustained damage. As part of the collective punishment policy carried out by Israeli forces against Palestinian civilians, since Thursday, 01 October 2015, Nablus has been cordoned in a way similar to the cordon imposed on the same city in the beginning of al-Aqsa Intifada. PCHR's fieldworker in the city said that "Yetshar" bypass road, south of Nablus, and Beit Foreik checkpoint, east of the city, were completely closed. Moreover, they redeployed at the checkpoints of Howara, Jeet, al-Naqoura village, and Deir Sharaf valley around the city. Israeli forces stationed at those checkpoints humiliate Palestinian civilians passing through the checkpoints. Also as part of the collective punishment policy practiced by Israeli forces against families of Palestinians accused of carrying out attacks against Israeli forces and/or settlers, on Tuesday morning, 06 October 2015, Israeli forces destroyed two houses in Jabal al-Mukaber village, southeast of occupied East Jerusalem, and rendered their inhabitants homeless. They also closed a room in a house belonging to a third family in al-Thawri neighborhood in Silwan village, south of the Old City. During the past week, Israeli forces and settlers continued to raid al-Aqsa Mosque and impose restrictions on the Palestinians' access to the mosque. A girl sustained serious wounds after a settler opened fire at her. The settlers carried out 36 separate attacks on Palestinian civilians and their property. Israeli forces remarkably escalated the use of force against Palestinian civilians participating in peaceful protests in the West Bank, especially in occupied East Jerusalem. During the reporting period, Israeli forces killed 4 Palestinian civilians, including a 14-year-old child; 2 of whom were killed in Jerusalem. Moreover, 148 Palestinian civilians, including 55 children, 3 photojournalists and 2 girls, were wounded throughout the West Bank. In addition, over 240 civilians were wounded in Jerusalem and its villages, and a girl was fired at by a settler. In the Gaza Strip, Israeli forces also continued to chase Palestinian fishermen in the sea. During the demonstrations which were organized in protest at the construction of the annexation wall and settlement activities led 4 civilians were wounded, including 2 children and a photojournalist, in a Kufr Qadoum village, northeast of Qalqilya. 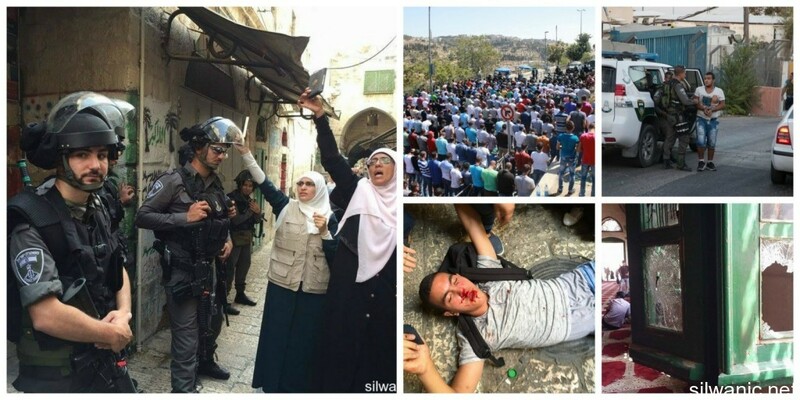 Moreover, 93) Palestinian civilians, including (32) children, (2) girls and (2) journalists, were wounded the demonstrations which were organized in protest of the Israeli occupation policy and the settlers' attacks against al-Aqsa Mosque. Following the Friday prayer on 02 October 2015, dozens of Palestinian civilians and international and Israeli human rights defenders organized a peaceful demonstration in Bil’in, west of Ramallah, in protest against the annexation wall and settlement activities. The protestors tried to cross the fence. Israeli soldiers stationed behind the wall, fired live bullets, rubber-coated steel bullets, tear gas canisters and sound bombs and chased them into the olive fields and into residential houses in response. As a result, many civilians suffered tear gas inhalation and others sustained bruises as Israeli soldiers beat them up. On the same day, dozens of Palestinian civilians organized a peaceful demonstration in the center of Ni’lin village, west of Ramallah, in protest against the Annexation Wall and Settlement Activity. The demonstrators took the streets and headed to the annexation wall. Israeli forces prevented the demonstrators from crossing to the land behind the Annexation Wall, so they threw stones at them. Israeli soldiers fired live bullets, rubber-coated metal bullets, sound bombs and tear gas canisters at the civilians, and chased them into the village. As a result, many civilians suffered tear gas inhalation and others sustained bruises as Israeli soldiers beat them up. Around the same time, dozens of Palestinian civilians and Israeli and international human rights defenders organized a peaceful demonstration in al-Nabi Saleh village, southwest of Ramallah, in protest against the annexation wall and settlement Activity. The demonstrators headed to the lands that the settlers are trying to rob by force near “Halmish” settlement. Israeli forces had closed all the entrances of the village since the morning to prevent them from participating in the demonstration. When they arrived at the aforementioned land, the demonstrators were met by live bullets, tear gas canisters, rubber-coated steel bullets, sound bombs and were chased into the village. As a result, many civilians suffered tear gas inhalation and others sustained bruises as Israeli soldiers beat them up. At approximately 13:30 on Friday, Palestinian civilians and Israeli and international human rights defenders organized a protest in the center of Kafor Qaddoum village, northeast of Qalqilya, heading to the eastern entrance of the village in protest against closing that entrance since the beginning of al-Aqsa Intifada with an iron gate. When they arrived at the entrance of the gate, the demonstrators were met by live bullets, tear gas canisters, rubber-coated steel bullets, sound bombs. As a result, 4 civilians, including 2 children and a photojournalist were wounded. Following the Friday prayer on 02 October 2015, dozens of Palestinian youngsters gathered in the vicinity of the annexation wall, which was established over the Badres village lands, west of Ramallah and al-Beira, in protest at the settlers and Israeli forces' attacks and against al-Aqsa Mosque. The protesters threw stones at the Israeli soldiers stationed behind the annexation wall. Israeli soldiers fired live bullets, tear gas canisters, sound bombs against them in response and also chased the protesters inside the village. As a result, many civilians suffered tear gas inhalation and others sustained bruises as Israeli soldiers beat them up. In addition, the injured persons were treated on the spot. On Friday afternoon, 02 October 2015, dozens of Palestinian youths and youngsters gathered at al-Taweel mountain, adjacent of "Bes'out" settlement in al-Bireh city, to organize demonstration in protest at Israeli occupation's policy and settlers' attacks against al-Aqsa Mosque. The protesters threw stones at the settlement's fence and set fire at car tiers. Israeli forces stationed in the area fired live ammunition, rubber-coated metal bullets, tear gas canisters and sound bombs at the protests in response, and chased them into the village. As a result, two children sustained wounds and were taken to the Palestine Medical Complex Hospital in Ramallah to receive medical treatment. According to an ambulance's driver, Israeli soldiers directly attacked an ambulance. In addition, one of the Israeli soldiers fired 6 live bullets near the ambulance and 4 others in front of it. While the ambulance's driver turned back and under weapon threat, Israeli forces prevented him from leaving or transporting the wounded person and they forced him to turn off the ambulance and took the ambulance's key. Furthermore, 20 Israeli soldiers gathered around the ambulance and opened the rear door, when Nemer Malesa, 21, and Mohammed Faqeh, 33, attempted to prevent the soldiers from arresting the wounded child. One of the soldiers kicked Nemer on his right knee and violently pulled the aforementioned child by his legs and threw him onto ground then beat and kicked him in spite of his wound. When the ambulance's driver stepped out of the ambulance and headed to the back, one of the soldiers prevented him, and pushed him then shouted at him in Hebrew, while another soldier pointed his gun at his face and pushed him again into the ambulance. The soldier violently kicked the driver's door on the driver's foot. As a result, he sustained wounds and bruises to the foot. According to al-Shafi'i's statement: "They forced me by beating and kicking to stand and walk by my leg in spite of the wound and bleeding in my right knee. After 20 meters I could not walk due to the soreness, so one of the soldiers carried me on his back then took me at "Besigout" settlement. There, they put me behind the cement cubes and beat me again by slapping at my face, also they handcuffed me by a plastic ligament and blindfolded me while lying on my back. An hour and a half later, they handed me over to a Palestine Red Crescent Society ambulance, which transported me to the Palestinian Medical Complex. After conducting medical examinations and x-ray, it was found that the bullet settled in the knee. The doctors directly transported me to the operation's room where they conducted a surgical operation to me which continued for 2 hours and I still receive treatment in the orthopedic department." On Friday afternoon, 02 October 2015, dozens of youngsters gathered in the southern entrance of Salwad village, northeast of Ramallah, on the road between Selwad and Yabroud, near Street (60) to organize a protest against Israeli policies. The protestors set fire to tires and threw stones at Israeli soldiers who fired live ammunition, rubber-coated metal bullets, sound bombs and tear gas canisters in response. As a result, many civilians suffered tear gas inhalation and others sustained bruises as Israeli soldiers beat them up. The injured persons were treated on the spot. On Friday afternoon, dozens of youngsters gathered at the southern entrance of Jalzoun refugee camp, north of Ramallah, near the UNRWA boys school, which is about 300 meters away from "Beit Eill" settlement fence, to organize a protest against Israeli policies against al-Aqsa Mosque . The protestors threw stones at the "Beit Eill" settlement fence near the camp. Israeli soldiers fired live ammunition, rubber-coated metal bullets, sound bombs, sewage water and tear gas canisters in response and chased them inside the refugee. As a result, many civilians suffered tear gas inhalation and others sustained bruises as Israeli soldiers beat them up. Following Friday prayer, dozens of civilians organized a peaceful demonstration in front of Wasaya al-Rasoul Mosque in the south of Hebron. The participants Raised the Palestinian flags and chanted national slogans for supporting al-Aqsa Mosque towards the Israeli attacks against the sanctities in the Occupied Jerusalem. The demonstration headed to Tareq Ben Ziyad street area where Israeli soldiers were deployed. When the participants arrived at the area, Israeli forces fired sounds bomb and tear gas canisters at them. A number of youngsters stationed in the vicinity of houses and shops, threw stones and empty bottles at the soldiers. In the meantime, many military vehicles and a wastewater pumping vehicle, raided the area, ordered the demonstrators to leave and flooded the residential houses by wastewater. In the meantime, many civilians suffered tear gas inhalation while Israeli forces maintained their presence in the area until 18:00, during which time the Israeli forces fired tear gas canisters in Kayta'oun and Tal'a Abu Hadeed neighborhoods towards civilians' houses. As a result, fire caught on an uninhabited apartment and a part of it was burnt as a tear gas canister penetrated the window which overlooking to the street. The fire was put out by a fire engine belonging to Hebron Municipality. After that, it was found that all the house's furniture was burnt, including blankets and wooden cabinets. The aforementioned apartment belongs to Amjad Abed al-Raheem Abed al-Hameed Abu Hadeed, 43. At approximately 15:30 on Sunday, 04 October 2015, a number of angry youngsters threw stones and empty bottles at Israeli stationed at the western entrance of al-Shohada Street and military checkpoint (56) in Hebron. They also set fire to rubber tires. Israeli soldiers chased the youngsters between shops and fired live ammunitions, rubber-coated metal bullets, and sound bombs indiscriminately. As a result, a 16-year-old child sustained bruises to the right arm and the left leg when he fell from a high place due to suffering gas inhalation and unconsciousness. He was taken by an ambulance belonging to Palestine Red Crescent Society to the Hebron Hospital to receive medical treatment. On Sunday, 04 October 2015, dozens of Palestinian civilians gathered near al-Huda petrol station in al-Balou' neighborhood at the northern entrance of al-Bireh city. They then headed to (DCO) military checkpoint and "Biet Eill" settlement. The protestors set fire to tires and threw stones at Israeli soldiers who fired live ammunition, rubber-coated metal bullets, sound bombs and tear gas canisters in response. As a result, 7 civilians, including 2 children were wounded, and were transported to the Palestine Medical Complex in Ramallah to receive medical treatment. From the morning until the evening on Monday, 05 October 2015, dozens of Palestinian civilians gathered near al-Huda Petrol Station and City-in hotel in al-Balou' neighborhood, at the northern entrance of al-Bireh city. They then headed at (DCO) military checkpoint and "Beit Eill" settlement. The protestors set fire to tires and threw stones at Israeli soldiers who fired live ammunition, rubber-coated metal bullets, sound bombs and tear gas canisters in response. As a result, (20) civilians, including (8) children were wounded; (11) of them were wounded by live ammunition while the other (9 were wounded by rubber-coated metal bullets, tear gas canisters and sound bomb. The wounded persons were taken to Palestine Medical Complex in Ramallah to receive medical treatment. That afternoon, dozens of Palestinian youngsters gathered near 'Atara checkpoint, north of Ber Zeit, north of Ramallah. The protestors set fire to tires and threw stones at Israeli soldiers who fired live ammunition, rubber-coated metal bullets, sound bombs and tear gas canisters in response. As a result, (3) civilians, including (2) children were wounded and were taken to the Palestinian Medical Complex in Ramallah to receive medical treatment. A 16-year-old child was wounded by a bullet to the chest; a 16-year-old child was wounded by bullet's shrapnel to the right thigh; and a 20-year-old civilian was wounded by a bullet to the back. At approximately 14:30 on Monday, a number of youngsters gathered and threw stones and empty bottles at the Israeli forces stationed at the western entrance of al-Shohada Street and (56) military checkpoint. Moreover, set fire on the rubber tires. In response, Israeli soldiers chased the youngsters between shops and fired rubber-coated metal bullets, sound bombs and tear gas canisters against youngsters and shops indiscriminately. As a result, a 20-year-old civilian was wounded by a bullet to the head then he was taken by an ambulance belonging to Palestine Red Crescent Society to the al-Ahli Hospital. Furthermore, a reporter of Raya FM radio, Taha Dawood Abu Hussain, 28, was wounded by a bullet to the right brow while he was present on Abu al-Humos road adjacent to the area of clashes to cover the incidents. He was then taken by an ambulance to Hebron Hospital. At approximately 18:30 on Monday, a demonstration was organized in Balata refugee camp, east of Nablus. The demonstrators headed to Hawara checkpoint at the southern entrance of the city. The protesters were surprised from the Israeli forces' presence in the al-Quds Street. When the protesters approached the checkpoint, Israeli soldiers fired sound bombs and live ammunitions at them. As a result, a 17- a year-old child from the camp was wounded by a bullet to the leg. At approximately 20:00, a number of youngsters gathered at the entrance of Beit 'Ainoun village, east of Hebron, and threw stones and empty bottles at the military vehicles. Israeli soldiers steeped out from their vehicles and chased the youngsters between the houses and fired rubber-coated steel bullets, sound bombs and tear gas canisters at the youngsters. Israeli soldiers abducted Waseem Isma'eel Jawabra, 28, from al-'Aroub refugee camp, north of Hebron, and took him to unknown destination. On Tuesday, 06 October 2015, a number of children and youngsters gathered at the southern entrance of Jenin. The youngsters threw stones at the soldiers stationed at the entrance. Israeli soldiers fired flash bombs, sound bombs, tear gas canisters and rubber-coated metal bullets toward stones throwers. They also abducted (2) children, Tareq Sabri Qabha, 16, and Ja'far Yaser Qabha, 16, but released them after they had questioned them. From the afternoon until the evening on Tuesday, 06 October 2015, dozens of Palestinian civilians gathered near al-Huda Petrol Station and City-in hotel in al-Balou' neighborhood at the northern entrance of al-Bireh city. They headed to the (DCO) military checkpoint and "Beit Eill" settlement. The protestors set fire to tires and threw stones at Israeli soldiers who fired live ammunition, rubber-coated metal bullets, sound bombs and tear gas canisters in response. As a result, (26) Palestinian civilians, including (13) children and girls, were wounded, (15) of them were wounded by live ammunitions, while (11) of them were wounded by metal bullets. The wounded persons were taken to Palestine Medical Complex in Ramallah to receive medical treatment. Moreover, many civilians suffered tear gas inhalation and others sustained bruises as Israeli soldiers beat them . The injured persons were treated on the spot. On Tuesday, dozens of Palestinian youngsters gathered at the entrance of Qalandiya refugee camp, north of occupied Jerusalem, to organize a demonstration on protest at the Israeli forces and settlers' attacks against the al-Aqsa Mosque. Israeli forces deployed a large number of heavily armed soldiers at the checkpoint. The protesters set fire to rubber tires and threw stones and empty bottles at the Israeli forces. In response, Israeli soldiers fired live ammunition, rubber-coated metal bullets, sound bombs and tear gas canisters at the protesters. As a result, 16 civilians, including 7 children and a journalist, were wounded, 9 of whom were wounded by live bullets, while 7 others were wounded by metal bullets. On Tuesday, 06 October 2015, clashes erupted with the Israeli forces in the vicinity of the annexation wall in Qanta village, northwest of occupied Jerusalem. As a result, a 20-year-old civilian was wounded by a bullet to the right side of the head which caused a fracture to his skull and hemorrhage in his brain. The aforementioned civilian was admitted into the intensive care unit in Palestine Medical Complex in Ramallah, and his condition was described as serious. At approximately 20:00 on Tuesday, a number of children and youngsters gathered at al-Jamla checkpoint between Jenin and Israel. The youngsters threw stones at the soldiers. In response, Israeli forces fire live ammunition, rubber-coated metal bullets, sound bombs and tear gas canisters at the stones throwers. As a result, a 15-year-old child was wounded by a bullet to the left leg. In addition, Israeli forces abducted a number of protesters. On Wednesday, 07 October 2015, hundreds of Bir Zeit University's students and Palestinian civilians gathered near al-Huda Petrol Station and City-in Hotel in al-Balou' neighborhood, at the northern entrance of al-Bireh city. They then headed to the (DCO) military checkpoint and "Beit Eill" settlement. The protestors set fire to tires and threw stones at Israeli soldiers who fired live ammunition, rubber-coated metal bullets, sound bombs and tear gas canisters in response. As a result, (10) Palestinian civilians, including a girl were wounded, (8) of them were wounded by a live bullets, one of them was wounded by a shrapnel, and the last one was wounded by a sound bomb. All of the wounded persons were taken to Palestine Medical Complex in Ramallah to receive medical treatment. Moreover, members Israeli undercover units who were present in the demonstration among the protesters, abducted 3 of Bir Zeit University's students after firing at them from a short distance and violently beating them with the support of the Israeli soldiers and border guards. After that, the students were taken to an unknown destination. The abducted persons were identified as: Abdul Rahman Abu Dhab ,20; Ahmed Waleed Abullah Hamed, 21, who was wounded to the leg; and Mohammed Othman Husain, 19, who was wounded by a bullet to the head and his condition was described as a serious. Israel continued to impose a total closure and has isolated the Gaza Strip from the outside world. Israeli navy forces continued to open fire at Palestinian fishermen in the Gaza Strip sea. On 05 October 2015, Israeli gunboats stationed off Gaza City shore abducted 2 Palestinian fishermen, who were on board a fishing boat 6 nautical miles off the seaport, west of Gaza City. Israeli forces abducted 9 Palestinian civilians attempted to cross the Gaza Strip's border into Israel. 3 traders, who are brothers, were abducted at Beit Hanoun (Erez) crossing while heading from the Gaza Strip to Israel. Also in the Gaza Strip, on 2 October 2015, Israeli forces moved about 100 meters into the east of al-Qarara village, east of Khan Yunis. They levelled lands and withdrew later. The PCHR also called upon the High Contracting Parties to the Geneva Conventions to compel Israel, as a High Contracting Party to the Conventions, to apply the Conventions in the Occupied Palestinian Territories. At least 1,289 Palestinians have been left wounded in clashes with the Israeli occupation troops across the occupied West Bank and Jerusalem, the Palestinian Red Crescent reported Thursday. According to official data released by the Red Crescent, 1,298 Palestinian civilians have been injured over the past five days, 76 among whom sustained live bullet wounds and 344 sustained rubber bullet injuries. 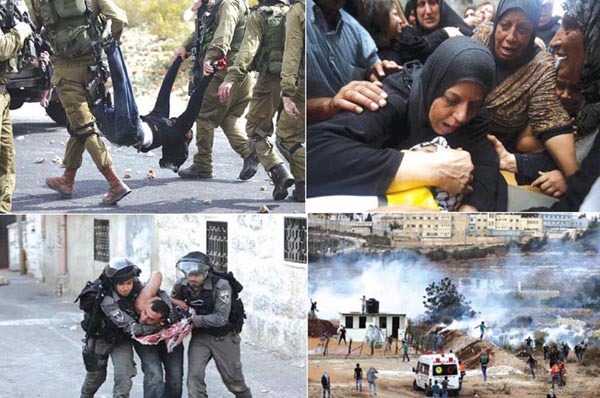 849 Palestinians choked on tear gas and 20 others were subjected to heavy beating, the organization further documented. Tension has been running high in the West Bank and Jerusalem after the Israeli occupation troops and extremist settlers stepped up aggressions on the holy al-Aqsa Mosque and the peaceful Muslim congregation. Several Palestinians were critically wounded in aggressive attacks, by the occupation patrols, on pro-Aqsa demos. Dozens of Palestinians were injured during violent clashes that broke out Wednesday across West Bank and occupied Jerusalem, medical sources said. According to the Palestinian Red Crescent, 288 Palestinians were injured across the occupied West Bank on Wednesday, including 89 by rubber-coated steel bullets and 10 with live rounds and 189 who suffered from tear gas inhalation. In Ramallah, an Israeli undercover unit kidnapped four Palestinian youths during clashes that broke out at Beit El checkpoint north of the city. One of the detainees was seriously injured after being shot in his head with a live bullet. The clashes broke out when Israeli forces quelled a large march that set-off from Birzeit University towards the Beit El settlement. The Israeli forces heavily fired rubber-coated bullets, tear gas, and live fire at the youths. Journalists were also attacked during the clashes while trying to film the kidnapping process of four Palestinian youths. Hundreds of students have participated in the massive march heading to Beit El settlement in protest against settlers’ deadly attacks. In al-Khalil, fierce clashes were reported in different parts of the city between local youths and Israeli forces. Clashes broke out in the town of Beit Ummar north of the city, when Imad al-Sleibi, 17, was detained by Israeli forces and taken to the nearby illegal Israeli settlement of Karmi Tzur. A local official said Israeli soldiers chased several other youths in an attempt to detain them during clashes in the al-Thahr area of Beit Ummar, near the settlement, taking over the rooftops of three homes in the area and firing tear-gas and stun grenades from the roofs, causing several teargas suffocation cases among locals. Similar clashes were reported in Yatta town between Israeli forces and Palestinian youths after a Palestinian man, identified as a young man from the area, was killed in Kiryat Gat in southern Israel. In Bethlehem, several youths choked on teargas as clashes erupted at the northern entrance of the town. In occupied Jerusalem, Israeli police stormed and violently searched the house of Shourouk Dweikat who was earlier shot and seriously injured by an Israeli settler in the Old City. Shourouk was hospitalized in critical condition. In Qalqilia, several youths were injured while some others were detained as clashes broke out at the entrance of the city amid heavy fire of teargas bombs. At least four youths were hit with rubber-coated bullets, eyewitnesses said. In Jericho, confrontations were reported after Israeli police suppressed a peaceful march organized in the city in defense of al-Aqsa Mosque and in protest against settlers’ attacks against Palestinians and their properties. Four Palestinians were hit with rubber-coated bullets during the clashes, while 30 choked on teargas. 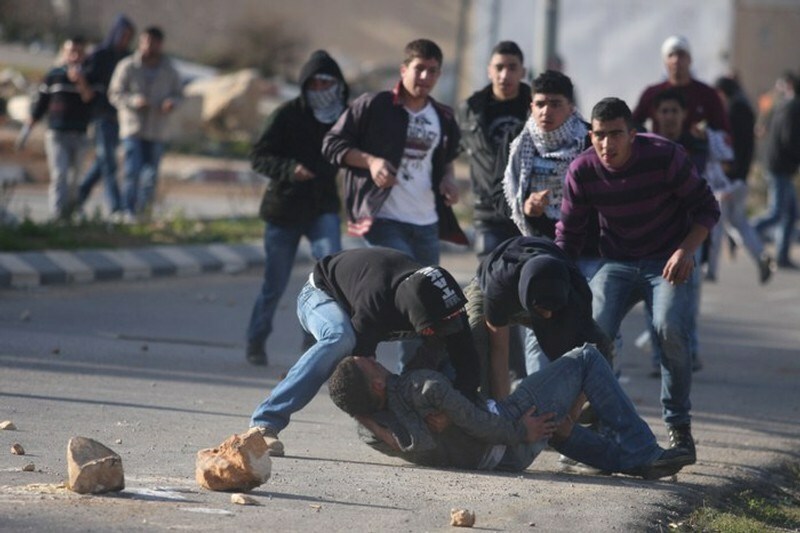 Three minors were also detained during the clashes including a boy with special needs. Over the past week, there have been increasing clashes between Israeli forces and Palestinians over the storming of the al-Aqsa Mosque by settlers, who are being backed by Israel's right-wing government. The Palestinian Ministry of Health (MOH) in the occupied West Bank has reported that at least 129 Palestinians have been injured by Israeli army fire and gas bombs in different parts of the West Bank, Tuesday, and that the soldiers deliberately targeted medics and journalists. In a press release, the MOH said fifty wounded Palestinians were transferred to the Palestine Medical Center in Ramallah; two of them suffered serious injuries after being shot with live Israeli rounds, while the rest suffered mild-to-moderate wounds. It added that eleven Palestinians were shot with rubber-coated steel bullets in Bethlehem. Seven more Palestinians were shot with rubber-coated steel bullets, while many residents suffered the effects of tear gas inhalation. in the southern West Bank city of Hebron. Furthermore, 45 Palestinians were injured in Nablus, and 16 in Jenin, both in the northern part of the West Bank, suffered mild-to-moderate injuries. Media sources in Jenin said two were shot with live rounds, and dozens suffered the effects of teargas inhalation, during clashes near the al-Jalama roadblock, north of Jenin. The soldiers also invaded a pottery store near the roadblock, and kidnapped the owner after assaulting him. Head of the Emergency Unity of the Red Crescent in Jenin Mahmoud Sa’adi said the soldiers also fired live rounds, rubber-coated steel bullets and gas bombs on protesters, who peacefully marched against the escalating Israeli violations, wounding two children, identified as Ahmad Abdul-Rahim and Mohammad Omran Sabah, in their legs. The two were moved to a hospital, while many Palestinians received treatment for the effects of tear gas inhalation. He also said that the soldiers attacked medics, and deliberately opened fire on a Red Crescent Ambulance, near Ramallah, smashing its windshield. In the Hebron district, in the southern part of the occupied West Bank, soldiers wounded many Palestinians, especially on the main junction leading to Kharsa village, and the Halhoul Bridge, during clashes that took place in the two areas. The soldiers also fired gas bombs at many homes, causing families to suffer the effects of tear gas inhalation. Two young men were shot with rubber-coated steel bullets in Bab az-Zawiya, in the center of Hebron city. Medical sources said two young men, 19 and 22 years of age, have been moved to the Hebron Governmental Hospital, suffering moderate injuries after being shot with rubber-coated steel bullets. Two Houses Destroyed in Jabal al-Mukaber Village and Room Closed with Concrete in al-Thawri Neighborhood in Occupied Jerusalem. As part of the collective punishment policy practiced by Israeli forces against families of Palestinians accused of carrying out attacks against Israeli forces and/or settlers, on Tuesday morning, 06 October 2015, Israeli forces destroyed two houses in Jabal al-Mokabber village, southeast of occupied East Jerusalem, and rendered their inhabitants outdoor. They also closed a room in a house belonging to a third family in ath-Thoury neighborhood in Silwan village, south of the Old City. The Palestinian Center for Human Rights (PCHR) condemns this crime that is added to the series of crimes committed by Israeli forces in occupied East Jerusalem in particular and in the occupied Palestinian territory (oPt) in general. PCHR stresses that this crime is part of the collective punishment policy adopted by Israeli forces against innocent Palestinians in violation of article 33 of the Fourth Geneva Convention that prohibits collective punishment and retaliatory measures against protected persons and their property. According to investigation conducted by PCHR, at approximately 00:30 on Tuesday, 06 October 2015, Israeli forces, including special units and intelligence officers, accompanied by explosive experts moved into Jabal al-Mokabber village, southeast of occupied Jerusalem, while a helicopter was hovering overhead. They raided two houses belonging to the families of Mohammed Ja'abis and Ghassan Abu Jamal. They obliged their occupants and over 23 neighboring families to leave their houses while firing sound bombs and tear gas canisters to frighten them and prevent them from approaching the area. Israeli forces then planted explosives inside the two houses and remotely blew them up. As a result, the two houses were completely destroyed while other houses sustained serious damage. It should be noted that the 110-square-meter house of Ghassan Abu Jamal used to shelter his wife, Nadia, and their 3 children, while the house of al-Ja'abees is located on the second floor in a 2-story building. In the same context, Israeli forces raided in the early morning a house belonging to Mo'taz Ibrahim Khalil Hejazi in ath-Thouri neighborhood in the south of East Jerusalem. They surrounded the house, closed its windows with iron plates and then poured concrete in his room. - Mohammed Nayef Ja'abis (21), from Jabal al-Mokabber village, was killed on 04 August 2014, when Israeli forces fired over 21 bullets at him from a close range after the bulldozer he was driving hit a bus on Street no. 1 opposite to Sheikh Jarrah neighborhood. Ja'abis was in his work, yet Israeli forces claim that he carried out an attack against the bus. - Former prisoner Mo'taz Ibrahim Khalil Hejazi (32) was killed on 30 October 2014, when Israeli special forces opened fire at him while being surrounded on the roof of his family's house in ath-Thouri neighborhood in Silwan village, under the pretext that he opened fire at Rabbi Yehuda Glick, west of Jerusalem. - Ghassan Mohammed Abu al-Jamal (32) was killed along with Odai Abed Abu al-Jamal after carrying out an attack on a synagogue in "Har Nov" area in Deir Yassin village in occupied Jerusalem. Israeli forces closed Odai's house with concrete in July. PCHR reiterates its condemnation of the destruction of the two houses and closure of a room, which are part of the collective punishment policy adopted by Israeli forces against the Palestinian civilians. PCHR reminds that article 33 of the Fourth Geneva Convention provides, "No protected person may be punished for an offence he or she has not personally committed. Collective penalties and likewise all measures of intimidation or of terrorism are prohibited". Therefore, PCHR calls upon the international community to take immediate and effective action to put an end to such crimes and reiterates its call for the High Contracting Parties to the Fourth Geneva Convention of 1949 to fulfill their obligations under Article 1; i.e., to respect and to ensure respect for the Convention in all circumstances, and their obligation under Article 146 to prosecute persons alleged to commit grave breaches of the Fourth Geneva Convention. These grave breaches constitute war crimes under Article 147 of the same Convention and Protocol I Additional to the Geneva Conventions.